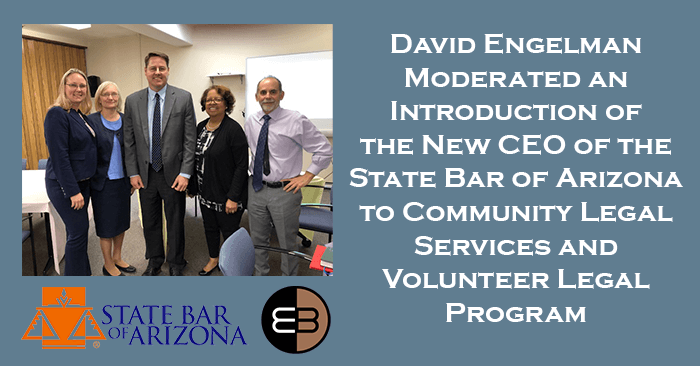 On Monday, March 18, David Engelman, co-founder of Engelman Berger, moderated an introduction of the new CEO of the State Bar of Arizona to Community Legal Services and Volunteer Legal Program. David coordinated this introduction and brought together specific individuals to discuss issues surrounding access to justice. These individuals included Joel England, the new Executive Director of the State Bar of Arizona, Lillian Johnson, the director of Community Legal Services, Pat Gerrich, the director of Volunteer Legal Program, and Krystal Ahart, the chair of the Volunteer Legal Program Advisory Board.